I didn't know what exactly to expect when I took this CD. I only knew that this EBM/Darkwave project comes from Argentina and my first association with this part of the world is Hocico. And what I found surprised me in a really positive way. 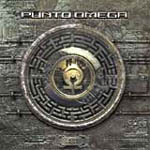 "Marcha hacia el punto omega", the first track of the album welcomes us with march drums, as if taken from a war movie. Then you can hear the bagpipes and choirs in the background - everything perfectly tuned into a harmonious whole, caressed with the violin parts… And then suddenly there appeared the stronger beats with guitar riffs, bringing associations with a song by Aries played by Talamasca. This really great introduction switches to the title song and is supplemented with a vocal - strong, deformed sound similar to fantastic Hocico, but this track is different than typical achievements of the Mexican group. It's light, pleasant, with the refrain rich in sounds and it's incredibly danceable. To me it's a potential party hit. And we can't forget about these well-fitted guitars. Then there comes "Guerra en los cielos" and everything seems to slow down to become more serious, it's less danceable and a note of pathos heavily accompanies it. Then a moment to catch your breath with "La caida" - just over a minute long song, in which a female voice dominates… or rather an electronically made choir. The impression that this song makes is that I didn't know whether something momentous would happen or the hell would suddenly fall upon my head. Fortunately, nothing like this took place. "Mundo de robots" started with a strong vocal and the dehumanised sound of the destroyed, polluted technological world. "Tempestades de cambio" once again introduces us to the climates as if taken from Hocico, then we move to "Peregrino de los tiempos". Both tracks are not very fast, probably to give us a moment's rest before the last song of the album. "Realidad virtual" is equally electrifying as the second song of the CD. It's fast, danceable, sharp. Once again the rather heavy guitars that unusually enrich the sound of the whole are king. It's the perfect ending - strong and pithy. There are no redundant iterludes, passages and no slowdowns. No weak points. Ps. The whole is supplemented with the second CD with remixes made by such experts as L'ame Immortelle or Grendel.